Caden and Emmy’s rooms both have brass-framed mirrored closest doors. Have I told you how much I love brass? Um, yeah no. The doors are not cheaply made. They are big and heavy. They also make me a little nostalgic, reminding me of the big antique-brass trimmed closet doors in my grandparents’ place in Palm Desert. We looked at replacing the doors, but for a number of reasons decided to refinish them. Reason number one was money. Good quality doors like these are expensive, and we are trying to renovate this house on a really tight budget. Reason number two was eco-friendliness. Reduce, reuse, recycle. And reason number 3 was that we couldn’t figure out how we would dispose of those big heavy beasts if we were to get rid of them! So, we decided to reuse the closet doors. They didn’t fit our design plan though, so they had to be given a facelift. Enter, my good friend spray paint. Don’t get me wrong. I use spray paint as little as possible. It’s definitely not zero VOC and it makes a mess, but there are some times you just need some good old metal-adhering spray paint. And it’s cheap. Michael took this project on. We took the doors and track out of the 2 closets and painted them outside. It took many layers and quite a bit of time, but we have brand-new looking doors for $25. Quite the budget-booster, (mostly) eco-friendly and much more convenient than hauling the doors away! 1. Take the doors off the track and the track off the floor and wall. 3. Clean the doors and hardware. Get dust and rust off. You might need a wire brush. 4. Either tape plastic over the mirror part or resign yourself to scraping paint off of mirror with a razor blade. Michael did the latter. 5. Spray several coats of spray paint on the metal frame. Plan on many light coats of paint. Too heavy and you’ll have drips. Be sure you bought a spray paint that adheres to metal. Read the label. 6. If you decide to scrape paint off of the mirror, do so once it’s dried. Use a razor blade. Otherwise, remove the tape and use a razor blade to touch up where the paint leaked through. 7. 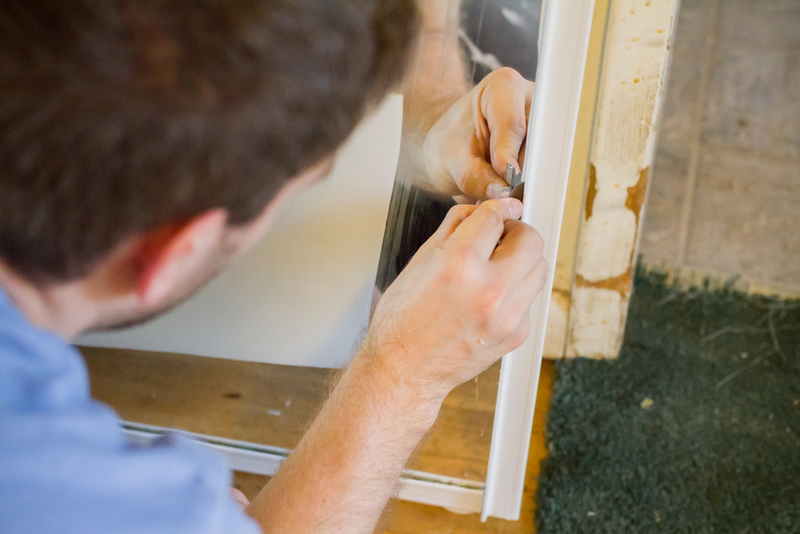 Run a line of painter's caulk around the inside of your door frame (smooth it with your finger or a little tool you buy at the hardware store) to hide any areas the paint couldn't reach. Scrape the excess off with a razor blade. 8. Reinstall the doors and admire your work. 1. Don’t try to paint when it’s below 50 degrees, no matter how tempted you are. Trust us. 2. Michael found that scraping the paint off the glass was best done around 3-5 hours after painting on a warm, fairly un-humid day. He said doing this kept the paint from chipping or peeling away from where we wanted it to stay. Our wood-beam ceiling has been the center of much discussion. Neither of us liked it. It was whitewashed or bleached and (to quote Michael) it looked “thirsty”. I originally wanted to *gasp* paint it white. I know, big mistake. Thankfully our realtor talked me out of that. Someday I will have a beach house with white beam ceilings though! Michael originally wanted to sand the whole thing (all 1700 sq ft of it) and stain it a dark brown. I thought he was nuts for wanting to sand 1700 sq feet over his head with a run-of-the-mill orbital sander, and I wasn’t sold on super dark ceilings. I was afraid they would make the house seem dark and closed in. Both of us were concerned about how a stain would cover the imperfections and existing bleaching on the ceiling. There is a section of beam over the kitchen wall that we are planning on removing, and we used that as our guinea pig. Michael sanded part of it, and we put a medium-dark semi-opaque stain on both the sanded and unsanded parts. Then we let it dry and spent a few days thinking about if we could live with the color. Sanded is on the left, unsanded on the right. Yes, the trim and outlet are wallpapered. I know, technically Michael should have been wearing a mask. He did, for most of the process. The semi-opaque stain covers the bleaching nicely, and it actually looked better on the unsanded beam than it did on the sanded part. In the end, with Michael doing the labor, it will cost us $200 for the brush and stain to do the entire ceiling. It’s a cheap facelift with a big payoff!